At the elevated heights of Rua Oscar Freire, Rua Teodoro Sampaio is known for music – up where Oscar Freire runs out of boutiques and restaurants, Teodoro crosses it with shops offering every kind of musical instrument and supporting electronics, instrument repair, scores and books, CDs, and the odd bar. Lower down though, Teodoro becomes a furniture market, with emporiums selling all types of mobiliário – beds, chairs couches and armchairs, stools, tables, accessories – and it stretches for many blocks. 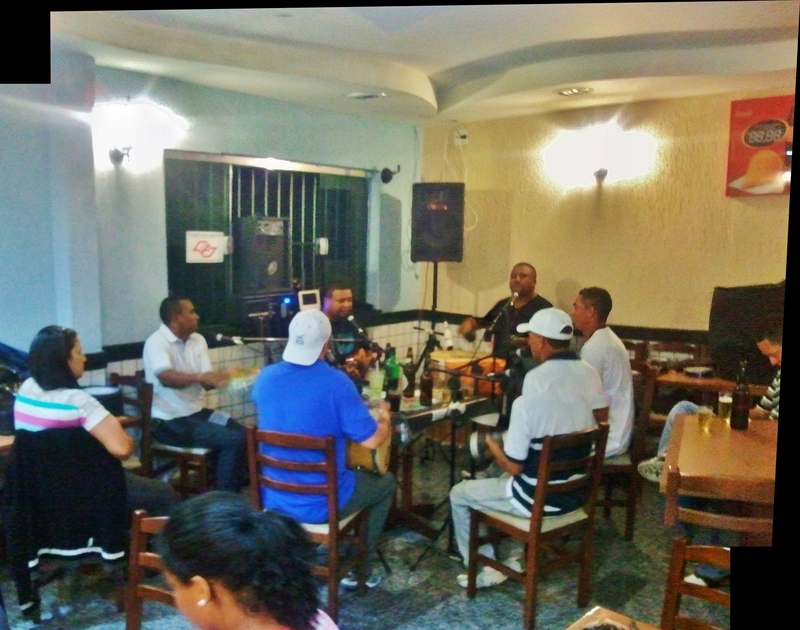 It’s surprising to find live music down here, but that’s just what the barzinho on the corner of Teodoro Sampaio and Rua Joaquim Antunes serves up every Friday night. 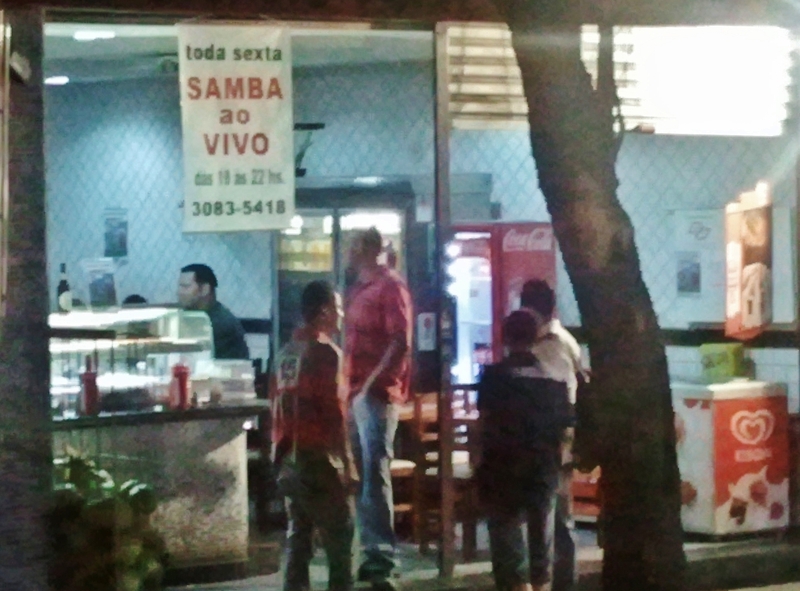 Making its presence heard easily over the traffic grinding its way up Teodoro, a samba band is playing and singing lustily. Assim Ta Bom (Well Alright!) has been playing samba together for 20 years. 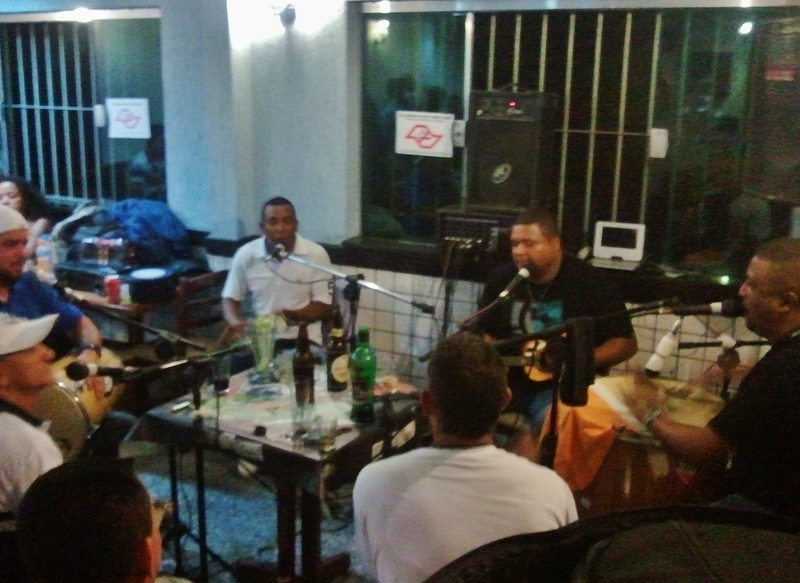 The core of the band is two brothers on surdo (a large standard bass drum played with a rubber-headed beater) and four-string cavaquinho, and a father-and-son team on percussion and vocals. They also substitute for the cuíca, a kind of squeaking drum, by imitating its characteristic sound vocally. A tantao and a tamborim complete the ensemble. All the players are mic-ed, and sing along vigorously. And as always in Brazil, not only the band but all of the audience too know the words, and they sing along freely. The band plays in the upstairs room, tiled and lit with neon. The beer is plentiful, and resupplied promptly; bar snacks are served too. The audience comes in large groups, and they run their tabs by putting the empties in their beer crate, and settling up at the end of the night. One table of eight or so consume a bottle of vodka – mostly the men – in an hour. It’s a raucous, good-natured event. The lyrics are bawled out over poly-rhythmic drumming, through which the cavaquinho melody can just be discerned. This music, played in the same circular grouping or roda as capoeira, is about the rhythm and the words. It prompts some startlingly impressive dancing. As a gringo tourist, I am made to feel completely welcome. Assim Ta Bom are loud, warm, enjoyable – much like Brazil. 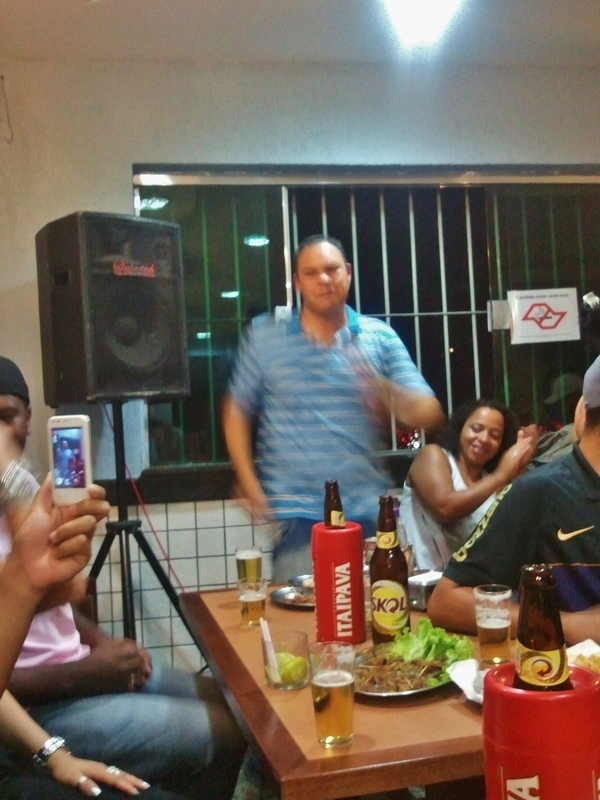 The way the locals respond to them – not just friends and family, but casual passers-by and bar regulars too – suggest that like Brazil, they are here to stay.